Personality: Hidan is one of the most foul-mouthed, disrespectful characters in the series; he frequently swears, curses, and complains at allies and opponents alike. He rarely uses honorifics when speaking, and even then, usually as a form of sarcasm. He is the only member of Akatsuki who does not respect their leader, Pain, and openly declares his willingness to kill him around others. The only respect he ever seems to give is to his god, and even then, he is quite willing to use his name as an insult. He openly holds his partner, Kakuzu, in contempt for his habit of blasphemy, love of money, and Kakuzu's frequent ridicule of Hidan's religion and battle style. Despite this, whenever Hidan is in the mood to kill, the two work together flawlessly in battle. Special Abilities: Hidan's primary ability is his complete inability to die, a result of extensive experimenting with the Jashin religion's various jutsu. His immortality allows him to survive numerous fatal injuries and ,almost any form of dismemberment; he even retains his ability to speak after having his head cut off. However, his head still needs to be connected to his body in order to control it, so Kakuzu apparently helps reattach it and other body parts when needed. This inability to die is the primary reason for his partnership with Kakuzu. Since Kakuzu cannot kill him, Kakuzu does not need to find new partners after his fits of rage. Although the two dislike working together, this advantage makes them the ideal team. Furthermore, while capable of surviving injuries that would otherwise be fatal, Hidan is still not immune to pain (though he seems to get over it very quickly, partly because of his sadomasochistic nature). Hidan standing within the Jashin symbol preparing for his ritualIn battle, Hidan wields a large crimson triple-bladed scythe that he uses as a multipurpose attack; he can wield it as a short or long-range weapon. He controls it with a long rope that is connected to a coil hidden under his robe. Although he is very agile and skilled in wielding it, capable of deflecting a swarm of shuriken thrown at close range with relative ease, Hidan claims that the large size inhibits his attack speed. He even openly declares himself as Akatsuki's member with the slowest attacking speed. Shikamaru also speculates that the weapon is designed specifically to draw blood instead of dealing major damage. Using this weapon, Hidan makes every attempt to acquire an opponent's blood, where upon consuming it he draws the Jashin symbol on the ground. This process somehow "links" his body with his opponents. Once this link is established, Hidan takes on a grim reaper-like appearance with black skin and white bone-like markings. In this state, he is essentially a voodoo doll for his opponent (any damage that is done to him is also inflicted on the opponent). Hidan refers to this as his "curse", and he is fond of toying with his victims by inflicting nonfatal injuries with his pike. He takes obvious pleasure in their shared pain. Once he is done toying with the opponent, or if he wants to kill them quickly, he impales himself through the heart, killing them and relishing in intense satisfaction. Despite its effectiveness, the curse has many requirements and can be a slow technique to employ. 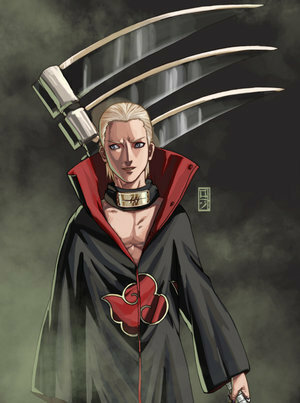 The curse may be avoided if the opponent happens to know what to look for and knows of Hidan's inability to die. The link between Hidan's curse and his opponent can be broken prematurely if Hidan is removed from the symbol;however, Hidan will remain in his transformed state, allowing the curse to be easily re-established by him simply entering the symbol's borders once more. Description: This technique is Hidan's primary method of killing his opponents in a way of the Jashin religion. First, Hidan makes every effort to draw blood from his opponent and consume it. After that, his skin turns black with white markings representing a skeleton, a symbol of absolute death. He then draws Jashin's symbol in the ground in blood and stands in the center. This serves as the link between him and his victim. Once his sacrificial ritual takes place, the victim can be considered dead unless Hidan either steps or is forced out of the circle. Any kind of pain that Hidan inflicts upon himself is inflicted upon his sacrifice, be it a mere scratch or a pierce in the heart. If Hidan is forced to step out of the circle, the link is broken and the victim would be set free, but all Hidan has to do is to step back into the circle to reactivate the link. Basically, this technique makes Hidan a living voodoo doll. History/Background Story: Hidan hails from Yugakure. Hidan belongs to a cult-like faith known as Jashin a religion that worships a deity of the same name. The primary teaching of this faith appears to be outright slaughter, where anything less than utter destruction is considered a sin. The amulet around his neck is a symbol of Jashin and he uses it to pray to his god before battling, requesting a good kill, or (when he is not allowed to) for forgiveness.After a fight, should he have time, Hidan performs a thirty-minute ritual consisting of lying within a Jashin symbol inscribed on the ground with a pike impaled through his chest. Hidan claims to be very devout to his faith, refusing to battle Yugito Nii without praying, and often claiming to be bringing his god's judgment down on his opponents.